FirstDown PlayBook began the installation of your brand new Bear defense this weekend. This is a big deal in many different ways. It not only is a big step in the ongoing process of building you a tool that fits any defensive front with any coverage up against any formation, but it also adds a very effective piece of almost any defensive coordinator’s call sheet. FirstDown PlayBook will install the Bear defense in increments and yesterday we began by fitting up the 34 Bear front with Cover 1 and 2 against two back formations. The coaching points and player assignments have been installed along with each defensive adjustment. We are not going to spend a lot of time beating this up here today but if you are an offensive line coach or any offensive coach who has ever spent time needlessly drawing the same practice cards day after day, week after week and yes, even year after year this will get your attention. As FirstDown PlayBook continues to ad to our Defense Builder section and then we add the editing tool feature that will allow you to move these players around then there will never be a reason to draw a practice card from scratch ever again. Stop and think about that for a minute. 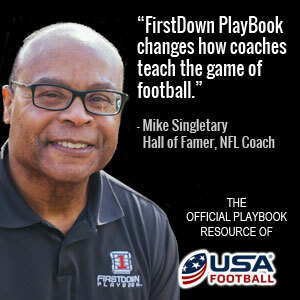 Just one more reason that the coaches who see FirstDown PlayBook for what it is today and also see the obvious future are going to be way ahead of the game in the next year.